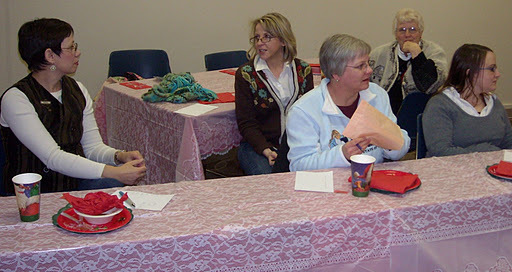 We gathered at the Girl Scout Office, thanks to Krista (what a great place to have a party). 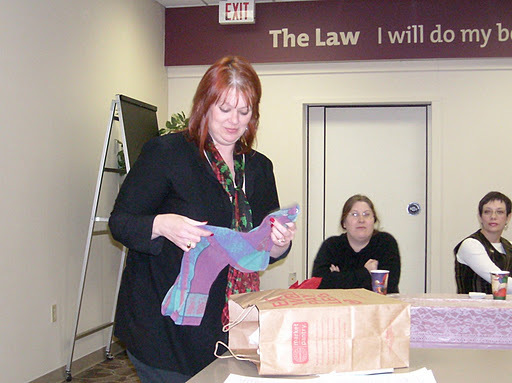 We had a brief meeting with the installation of officers and gifts given to the outgoing officers. 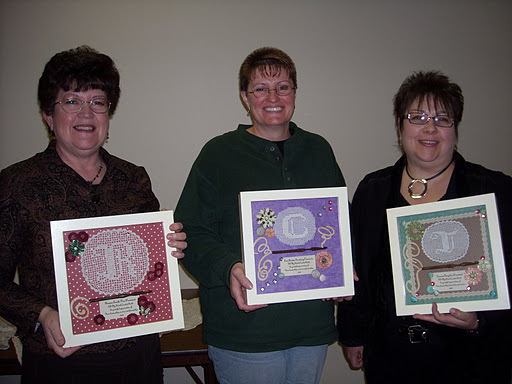 Three of the members crocheted the outgoing officers first initial (Paula, Krista and Linda C.) and then Sheri made a little keepsake box for each one of us. They are beautiful. 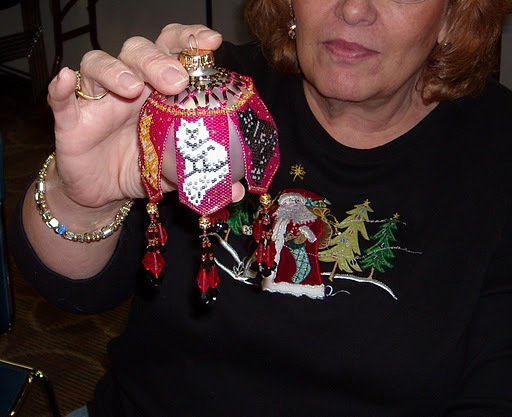 Mary made a cat beaded ornament for Linda C. for all of the hostess and donating of items to the drawings every month. It is gorgeous Mary. 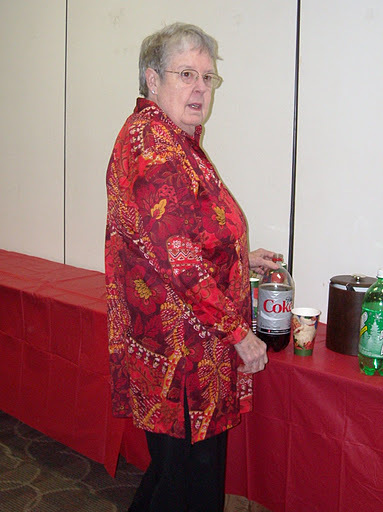 Mary also brought along a table cloth that she helped her mother make when Mary was all of 8 years old. 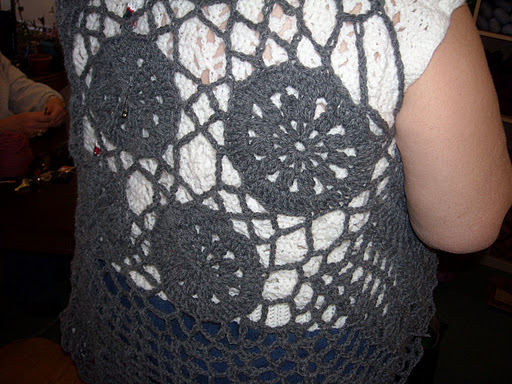 Queen Anne Lace with size 20 crochet thread and size 12 hook. It was amazing. Thank you for sharing that with all of us Mary. 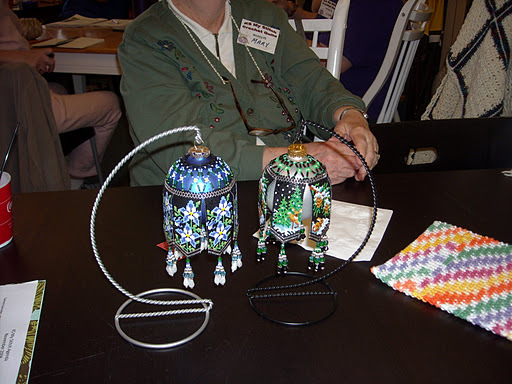 We also showed our designs for the design contest. 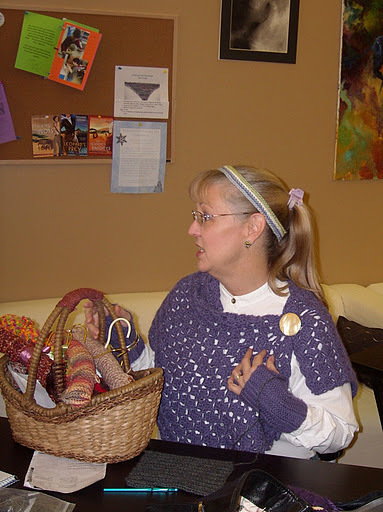 Mary’s curtains, Sue’s childs dress and jacket, Cori’s scarf and Tamara’s jacket. 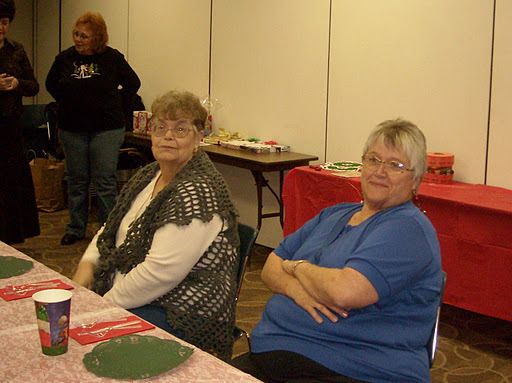 Sheri, Krista and Jinna conducted the Christmas party and activities. 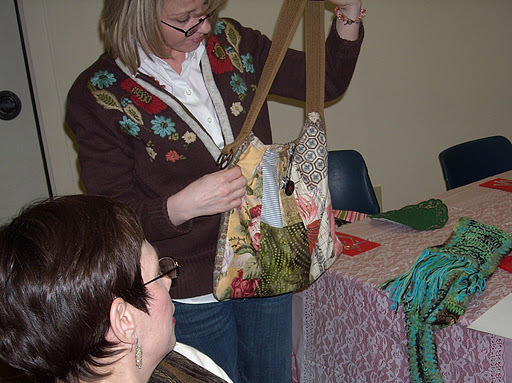 We had such a good time and Krista lead a fun game of guessing what size of hook is inside the numbered bags. It seemed like it would be easy, but it really isn’t when you can’t see them at all. It was a lot of fun though. Susie won with the most guessed right. 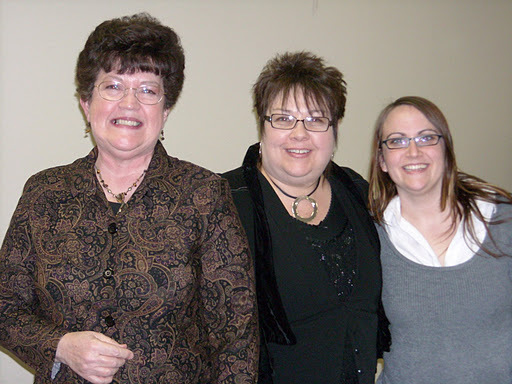 Thank you Sheri, Krista and Jinna for making all of the Christmas party happen. 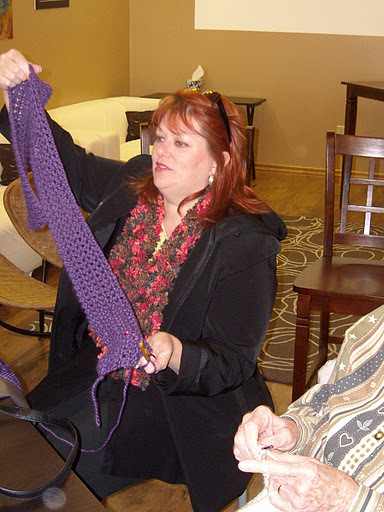 Sheri is working on a scarf and wearing a scarf made by her secret pal, she tells us that her husband has really taken a liking to her secret pal scarf, so if it comes up missing we will know where she can look. Susie has a basket full of goodies. 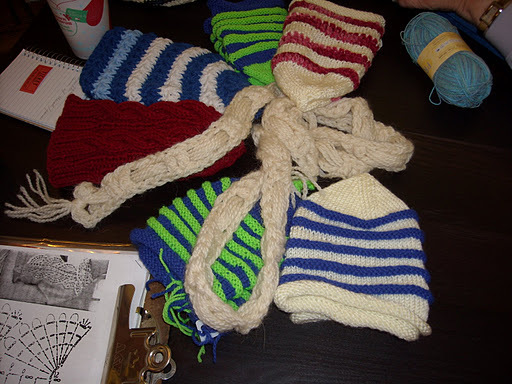 From crocheted hangers, hats and lots of neat things. 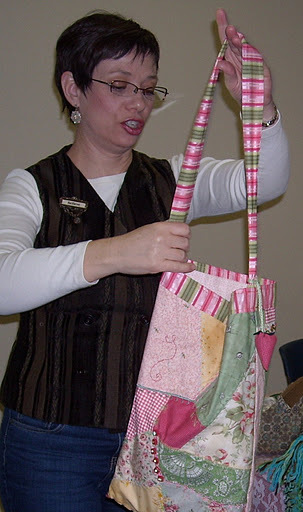 As soon as I have more time I want to make as many things as Susie does! 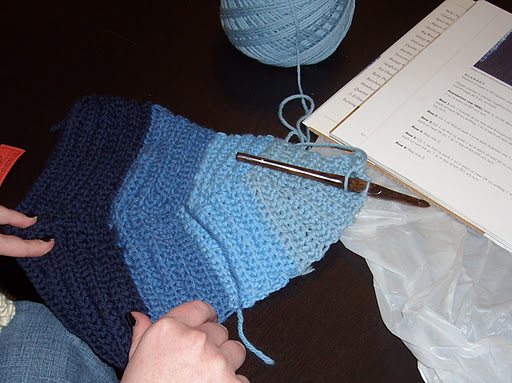 Paula’s friend is working on her first crocheted hat. She is doing a great job! 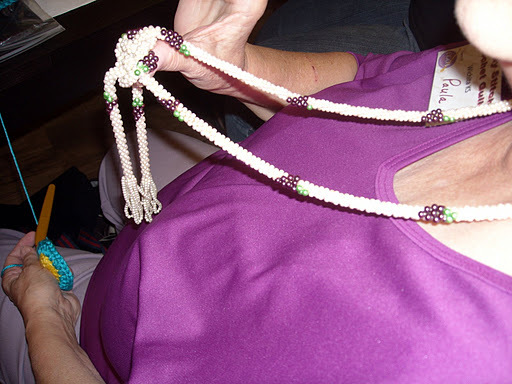 Mary has been beading again. Her artwork is amazing. 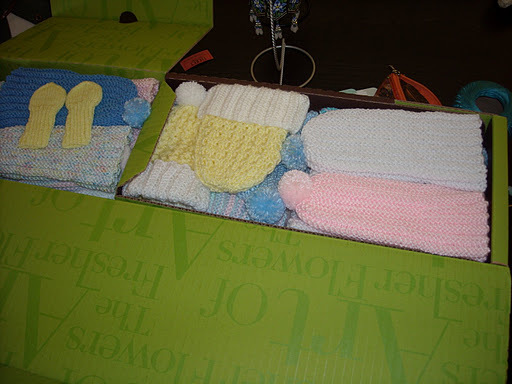 Mary also brought a box of hats & mittens that she has made for the hospital nursery neonatal unit. I think the box held 50 hats. Mary you are truly an inspiration to all of us. 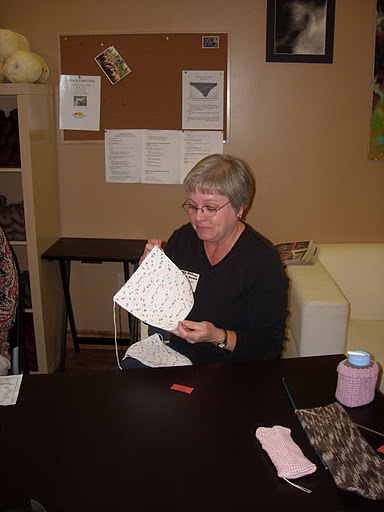 Mary was unable to attend the meeting that we learned the potholder stitch, so while we were at Twist one Thursday night I taught her how to do it and she brought her potholder that she had finished. 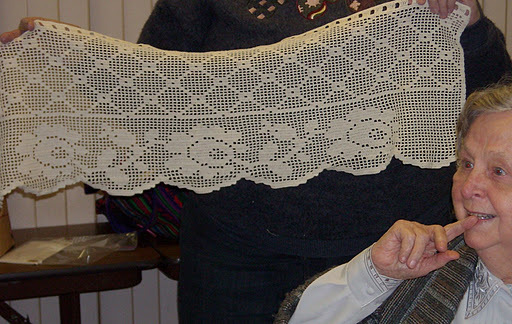 Rosina has made a cute snowman and a beautiful doily. 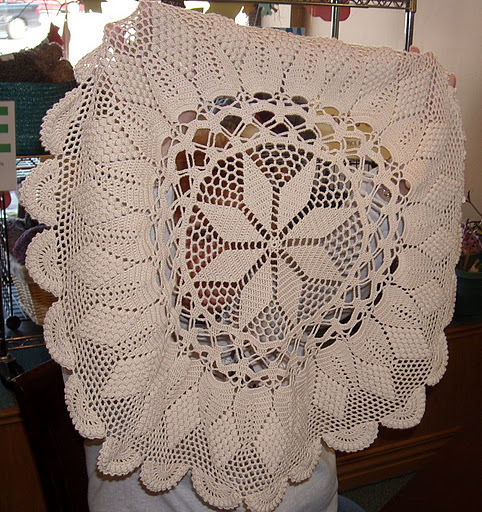 Linda C. has done it again with her popcorn stitch doily. 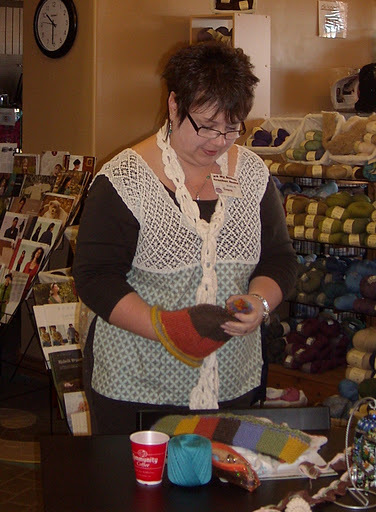 Pat is wearing a top that she has made and she is working on a jacket shawl. 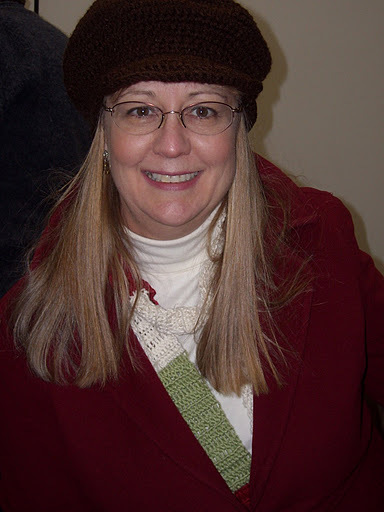 I had to confess that I had knitted a scarf and hat while I was in Houston at the International Quilt Market and Festival. 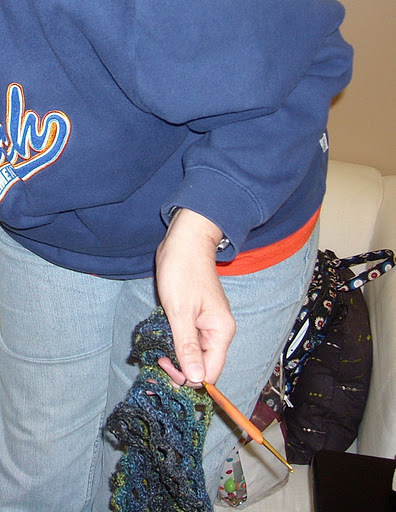 For some reason I just loved making the pom pom on the hat and wondered why I had never made one before. 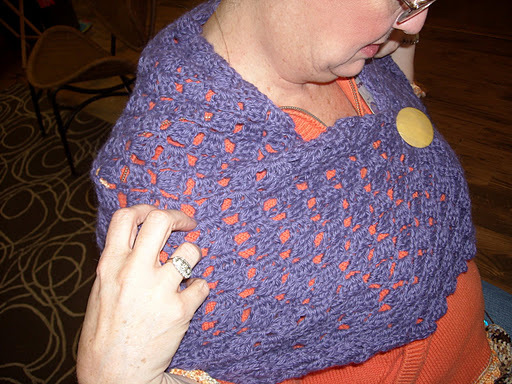 I also bought some silk yarn with sequins at the Festival in Houston and had just enough to crochet some trim on a recycled childs sweater. 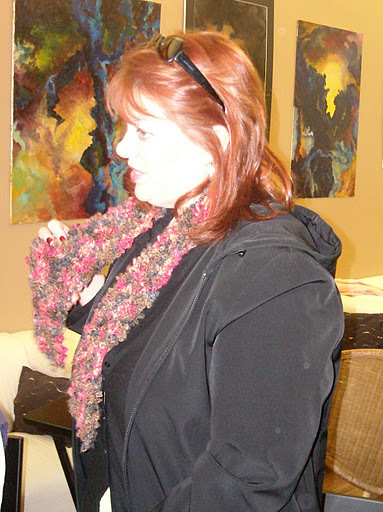 Then everyone wanted to know about the top and scarf that I was wearing. 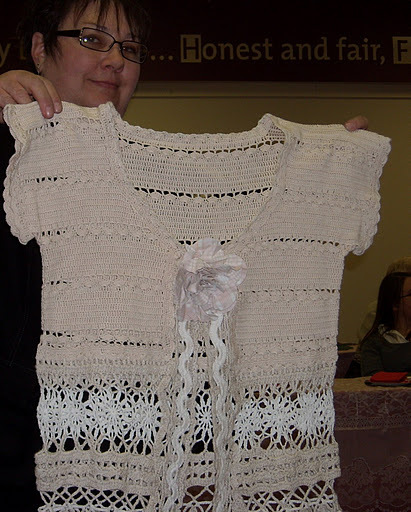 The top is made from a vintage bodice and my sister attached it to fabric and made me a baby doll top out of it. I love it. Thank you Jackie! 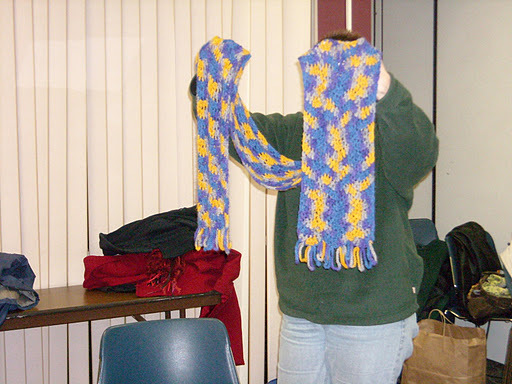 The scarf is made from motifs that were supposed to be a sweater but never grew into one, so I sewed the motifs together and made a scarf out of them. 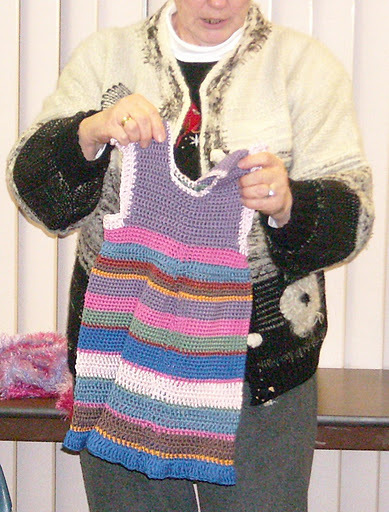 Every meeting we are blessed with items donated by some of our guild members. 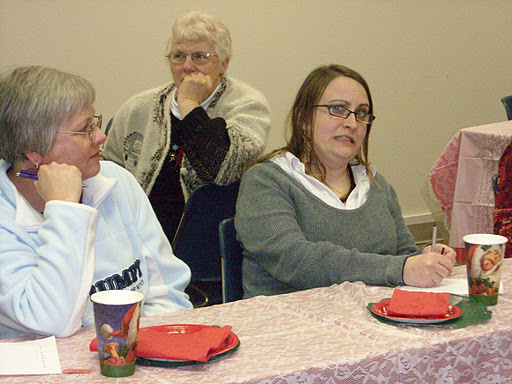 The November meeting was no exception. 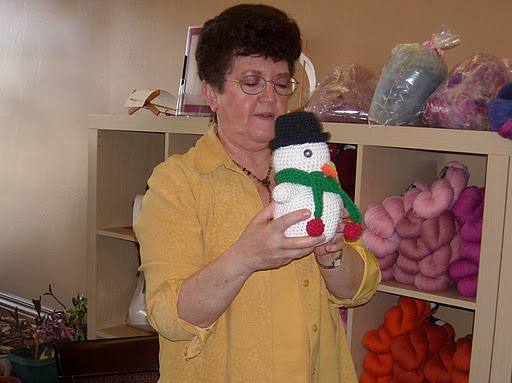 Linda C. donated doilies and butterflies as she did every meeting and look, it is the snowman that Rosina made. He was given away too. Thank you Rosina and Linda. 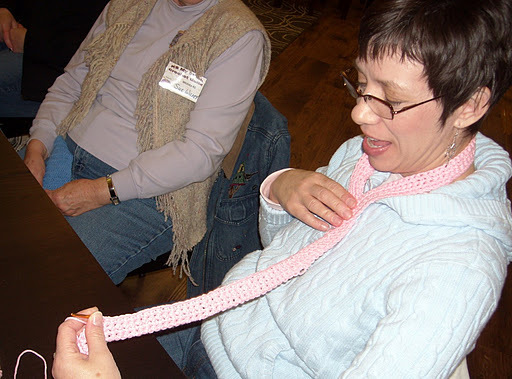 Jackie has been crocheting a scarf, imagine that, it is pink. One of her favorite colors. 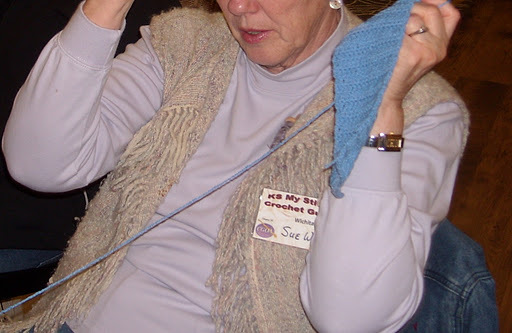 Sue is working on a headband warmer from the yarn that her secret pal gave her. 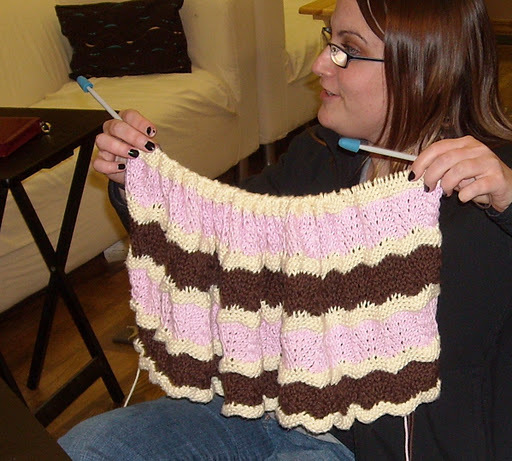 Wendy is working on a knitted blanket for her not yet born niece. 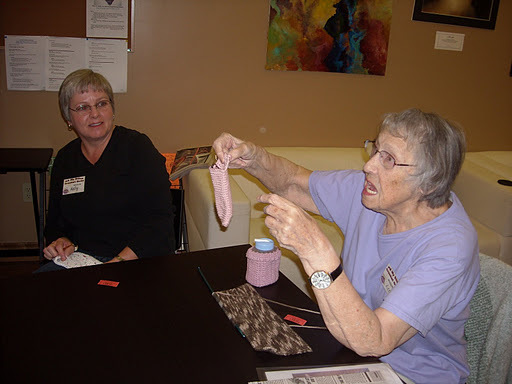 We don’t discriminate against knitters. Ha! Ha! 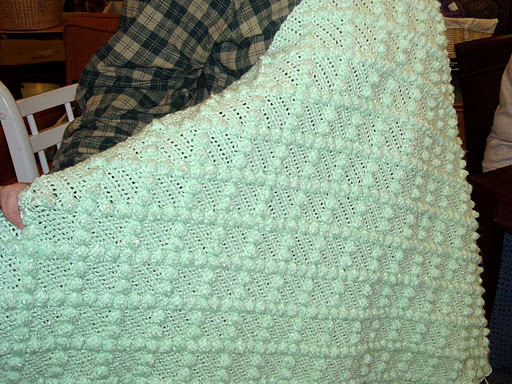 Geralyn is starting an afghan that I will be helping her with. The squares are not exactly square, but we are going to get to the bottom of that soon. Don’t give up Geralyn! 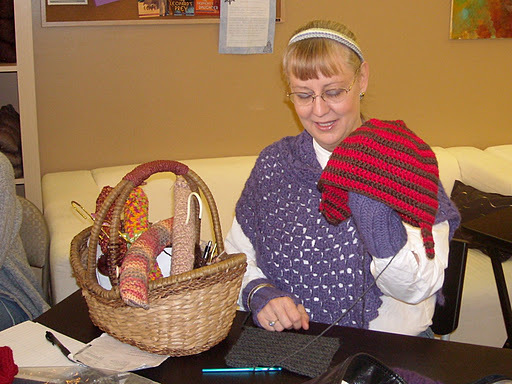 Cori is working on a scarf made out of Noro sock yarn. 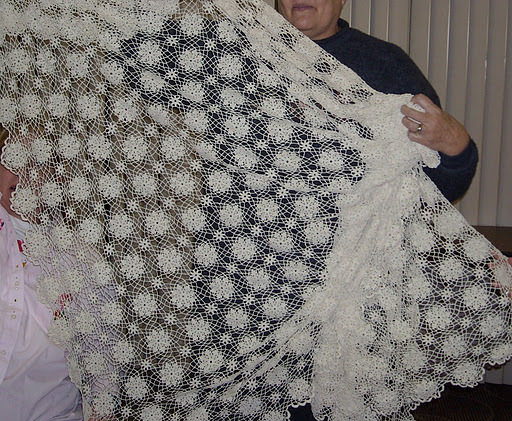 Susan’s round and square afghans. 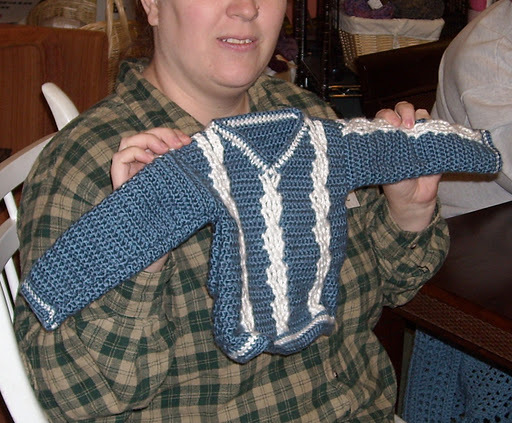 Lesa’s baby sweater and completed afghan that she started last month. Good job Lesa. 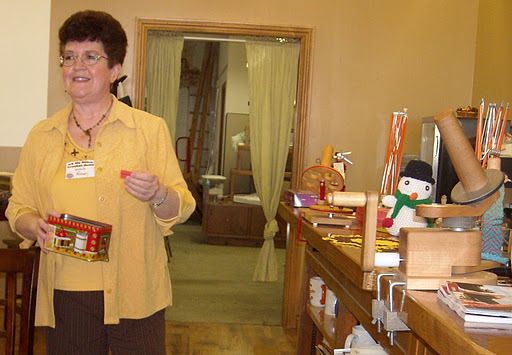 Thank you Pam for teaching us how to read the international symbols and helping us understand the different symbols. 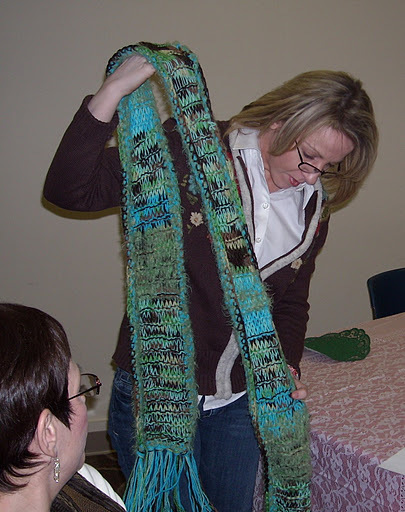 I had a great time doing the scarf. 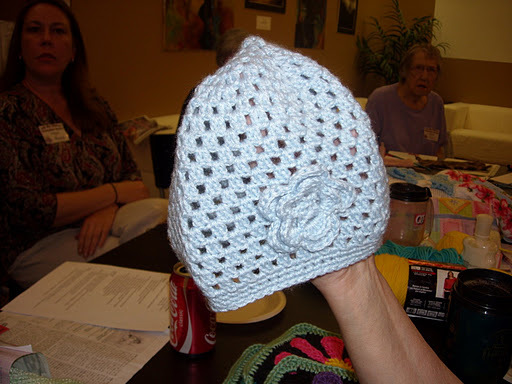 One of the hats with a flower for the Charity Workshop. 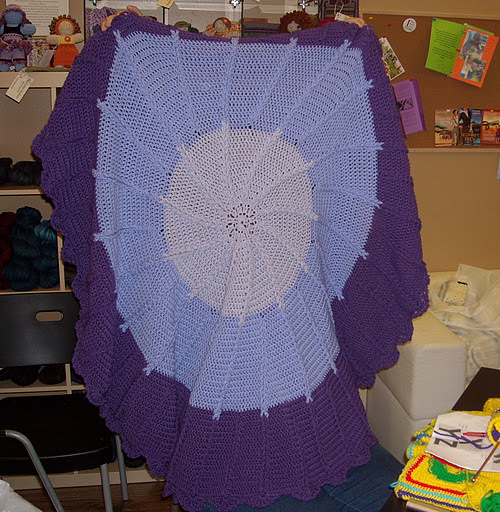 Cori’s fleece blanket with crochet around edge. 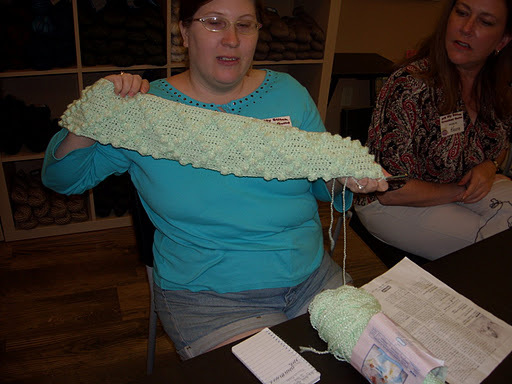 Lesa is making a crochet green afghan. 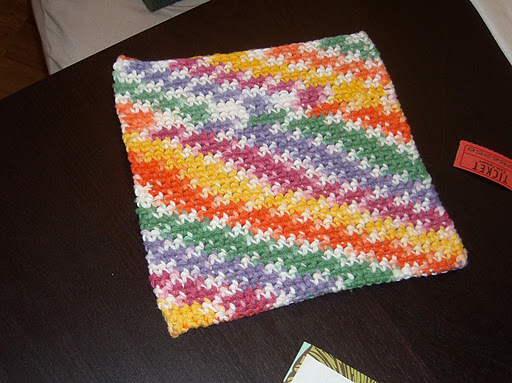 Krista made 2 potholders from the potholder stitch lesson in September. 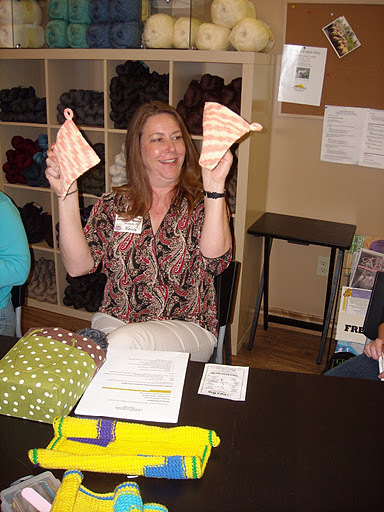 Kelly made a potholder too, she may have made more than one too. 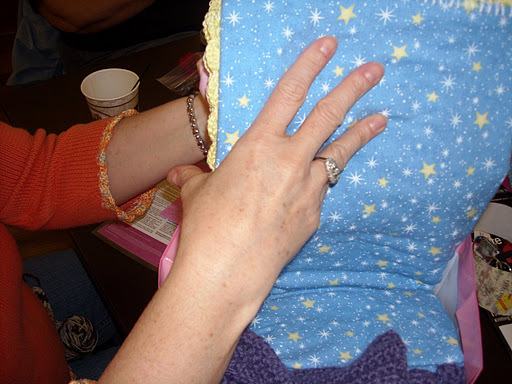 That was such a fun stitch to do and it was so amazing how it ended up being double thickness. 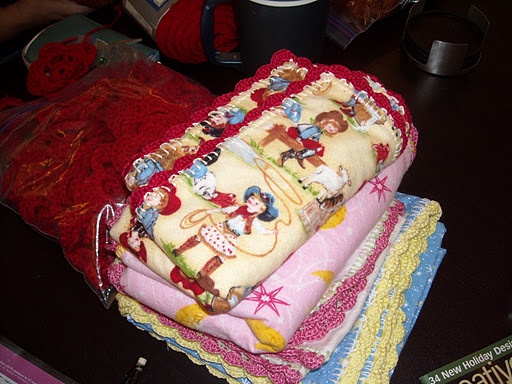 Lee agreed to test out my pattern for an iPod holder and hers ended up being an eyeglass case. Thank you Lee for testing it for me. Lee has been ill so I want her to know that I want her to get well so she can come back and join us for our evening meetings. WE miss you! 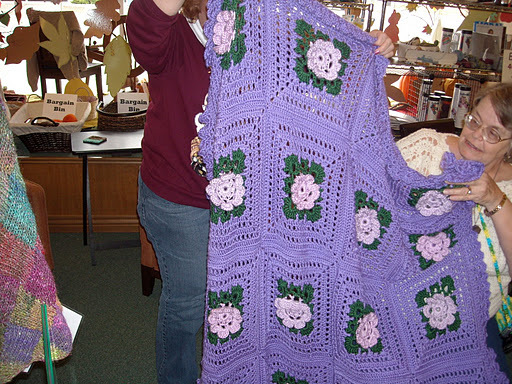 Linda C.’s beautiful flower afghan that she had started last month is now complete. 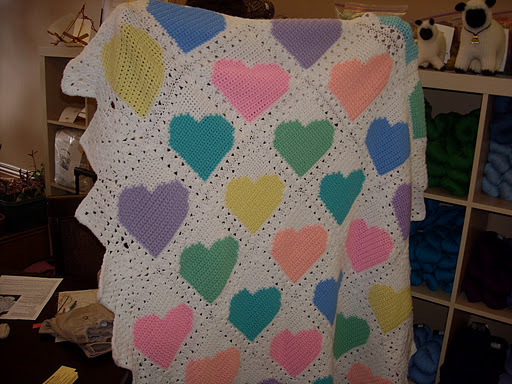 Rosina finished her heart afghan and did a wonderful job. 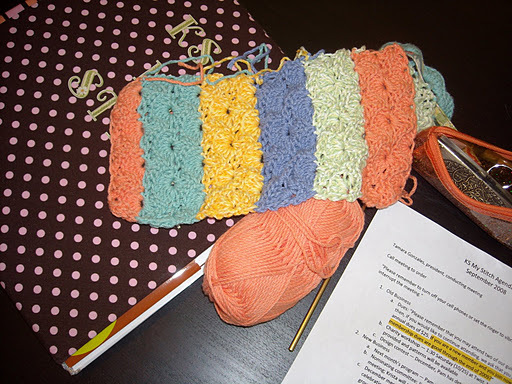 The start of my shell scarf. 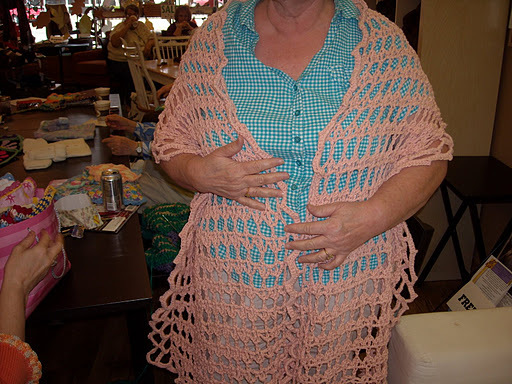 Jinna’s peach shawl. 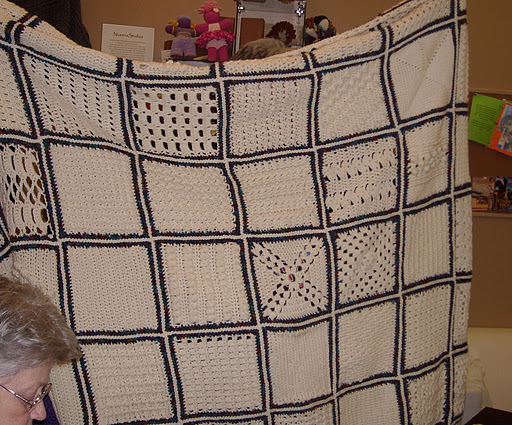 Susie has been very busy with her crochet, from her beautiful alpaca wrap, crochet edge flannel baby blankets, and crochet trimmed sweater. 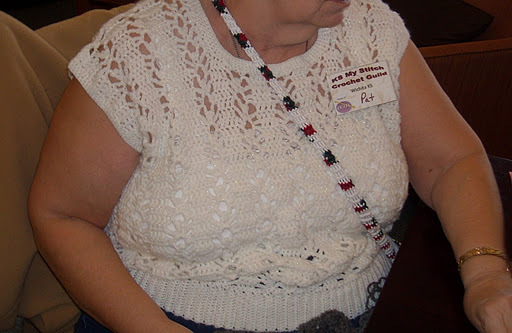 Paula had her crochet beaded necklace on and she didn’t think she had anything with her that was crochet. 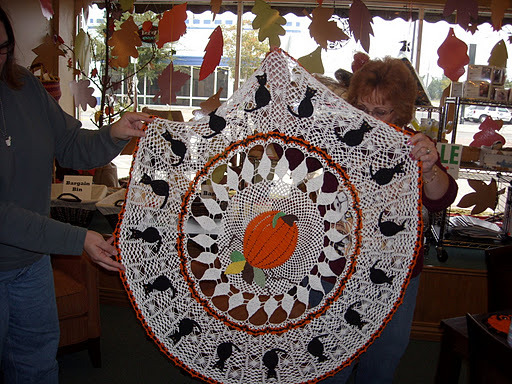 Of course last but not least Linda’s amazing pumpkin, spider web, black cat doily. 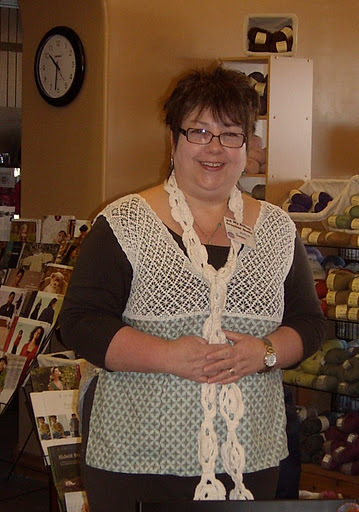 She is just something else with her doilies, I think every one will agree with me on that one.?. 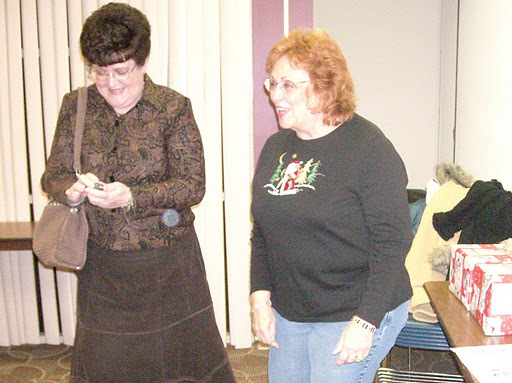 We also talked about our Christmas party and the plans were under way for finding a place and activities.